LOS ANGELES – For decades, the Los Angeles Clippers delivered owner Donald Sterling an identity: He was the biggest star of the biggest farce in the NBA. To him, life as a punch line always beat anonymity. The Donald was the Clippers. Sterling turned down richer deals to move the franchise to Orange County because he never wanted to relinquish the celebrity that his courtside seat in downtown Los Angeles gave him. Without the Clippers, Sterling simply was a multimillionaire slumlord. With them, Sterling had status in the celebrity culture of Hollywood. As the Clippers transformed into winners, something changed in Sterling's life: To the public, he no longer defined the franchise. Here came Blake Griffin. Chris Paul. Doc Rivers. They had big contracts, bigger profiles, and slowly, surely, Donald T. Sterling faded out of focus. "They're the stars of the Clippers show now, not Sterling anymore," one deposed Clippers official told Yahoo Sports. "They moved him aside and he didn't matter anymore. "But now, this [scandal] has made him relevant again. In his mind, he's the star of the Clippers again. Everybody's talking about him again. In his own way, he'll revel in this. I would bet there's no way [Sterling] will give in and sell his team. There's no way that he's going to do anything but stay and fight everyone until the very end to hold onto this." This is why there's so much pressure on NBA commissioner Adam Silver to deliver a devastating blow at his 2 p.m. ET news conference. Sterling's inclination will be to keep the team, keep the NBA mired in courts and the Clippers franchise will never survive it. Rivers will never return as president and coach under Sterling, sources told Yahoo Sports, and that'll start the beginning of a player mutiny that could result with several top Clippers also demanding out of the franchise. Several league officials – including owners and Board of Governors members – told Yahoo Sports they believe Silver has been studying the nuclear option on Sterling: a provision in the NBA's bylaws that would allow Silver to summon a vote of league owners to strip Sterling of his ownership. The NBA would run the Clippers until the team could be sold. Minimally, Silver could implement these penalties on Sterling: a one-year suspension, a $1 million fine and an assignment to counseling. For all the years former commissioner David Stern let Sterling slide, there's a strong belief Stern simply feared Sterling in the courts. Sterling is an attorney – he loves litigation – and Stern feared Sterling would become Al Davis to his Pete Rozelle. Despite his denial of ownership interest in the Clippers, Magic Johnson and potential investors spent part of Monday working to understand the avenues to which they could eventually make a deal to become Clippers owners, sources told Yahoo Sports. If the franchise becomes available, Johnson wants to be positioned to make a deal. For now, Sterling's estranged wife Shelly believes she can find a way to control the Clippers, but the NBA has no intentions of the team staying in the family's hands. That'll never be a compromise, because Silver and the owners understand the public tenor: The Sterling family must go. One by one, the owners are issuing statements of condemnation on Sterling. Most are sincere, and some are self-preservation. For so long, the rest of the NBA's owners never minded Sterling, because he was never a threat. The Clippers missed the playoffs over and over, bungled trades and draft picks, and the competitive advantages of leaving Sterling in place far outdistanced the moral outrage of his despicable history on race and decency. Mostly, he's never loved paying white players. In that way, he has an absolute plantation prism with which he sees players: He always preferred long, strong, physical players. To him, that's a basketball player: Big, black and strong. Yes, Sterling didn't want to so easily part with Eric Bledsoe, despite Rivers telling him they could never afford to pay Bledsoe in restricted free agency next summer. That was part of it, yes, but those who knew Sterling – who had history with him – believed largely that his disdain for paying $7 million per year for a white player caused him pause. Nevertheless, those days could be soon gone. 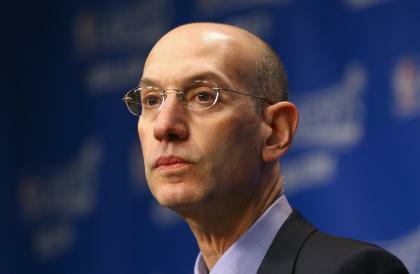 They could end today, when Silver comes to a moment of truth as NBA commissioner. In Sterling's own mind, he is the star again. It's Donald T. Sterling and those dysfunctional Clippers. Once and for all, Sterling needs to be stopped. David Stern was too scared, but here comes the commissioner's office of Adam Silver now. The nuclear option awaits inside his briefcase, and it's time to go the distance on Sterling now. It's time to make him go away once and for all.